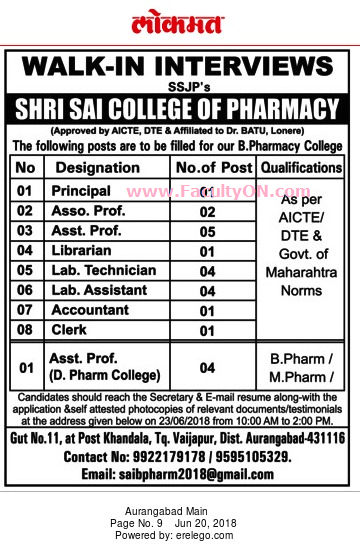 Shri Sai College of Pharmacy, Aurangabad has advertised in LOKMAT newspaper for the recruitment of Teaching Faculty- Principal / Associate Professor / Assistant Professor Plus Non-Faculty jobs vacancies. Interested and eligible job aspirants are requested to walk-in on 23rd June 2018. Check out further more details below. About College: Shri Sai Janvikas Pratishthan, 139, Shivai, N-3, CIDCO, Aurangabad (Maharashtra) was established under the Societies Registration Act (1860 Sub Act 21 of 1860) and Bombay Public Trust Act 1950 on 04-05-2002 and 12-08-2002, respectively. Dr. Pramod Uttamrao Shinde, the President of society is the eminent social worker of the Aurangabad region. How to Apply: Interested and eligible candidates are requested to send application along with CV, self attested copies of certificates and recent passport size photo the email address given below and then attend the Interview on 23rd June 2018. Reference: Advertisement from Shri Sai College of Pharmacy, Aurangabad on LOKMAT newspaper dated 20th June 2018 for the recruitment of vacancy position such as Principal / Associate Professor / Assistant Professor and non-teaching faculty jobs. See the copy of advt below.